The new emoji are listed in Emoji Recently Added v12.0, with sample images. These images are just samples: vendors for mobile phones, PCs, and web platforms will typically use images that fit their overall emoji designs. In particular, the Emoji Ordering v12.0 chart shows how the new emoji sort compared to the others, with new emoji marked with rounded-rectangles. The other Emoji Charts for Version 12.0 have been updated to show the emoji. The new emoji typically start showing up on mobile phones in September/October — some platforms may release them earlier. 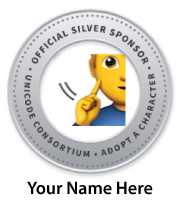 The new emoji will soon be available for adoption to help the Unicode Consortium’s work on digitally disadvantaged languages. The new Emoji 12.0 set includes the data needed for vendors to begin working on their emoji fonts and code ahead of the release of Unicode 12.0, scheduled for March 5. 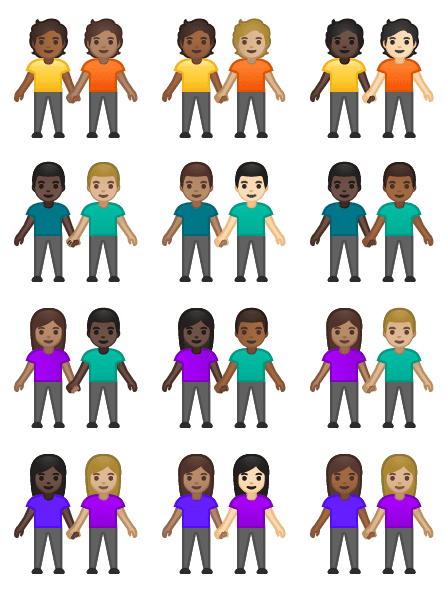 The people holding hands emoji now have four combinations of gender and all the various combinations of skin tones, for a total of 71 new variants. Implementations may optionally support skin-tone combinations for other multi-person emoji. The CLDR names and search keywords for the new emoji characters in over 80 languages, and the sort order for emoji, will be finalized by the end of March with the release of CLDR v35.